A go-to breakfast dish for all ages, poha is delicious in every variation - with onions (kanda-poha), potatoes (batata-poha), or even both. Its melange of textures - soft flakes of rice, toasted peanuts, grated coconut, soft veggies - make it fun to eat, and it's quick and easy to whip up when you're in a rush. Thalipeeth is a multi-grain Maharashtrian flatbread of sorts - guaranteed to give you enough energy until your next meal. Crisp, yet soft - thalipeeth is a great pick-me-up snack and goes best with a dollop of ghee and yogurt on the side. Another favourite breakfast food - sabudhana khichadi is vegan, gluten-free, and a great option. Humble and delicious, this dish is made using peanuts and boiled potatoes (in addition to the tapioca pearls) and is also enjoyed with a serving of fresh yogurt. Varan bhaat is a comfort food classic. Usually made for Ganesh Chaturthi, this simple meal of spiced yellow dal (usually made with toor or arhar dal) and rice is made even more comforting with a drizzle of ghee over the top! Batata-bhaji and freshly made pooris are always a good combination. The potatoes are cooked and flavoured with a tempered masala mix that give it a bright yellow colour - and are either eaten exclusively with the pooris as a meal, or served as a side-dish with some dal. Chicken Kala Masala is an aromatic, spicy gravy dish. 'Kala masala' is a traditional Maratha spice-mix, and can be used to cook with mutton as well. It's super tasty, and goes great when mopped up with soft chapatis, or poured over steamed rice. Kolhapuri-style mutton thalis are a heavenly assortment of spicy mutton dishes; usually - mutton fry, mutton rassa, mutton kheema, mutton alani - served with traditional bhakris (or chapatis), rice, papad, and solkadi. Lip-smacking good! Another Ganesh Chaturthi special - modaks are a well-loved Maharashtrian sweet dish. From the classic rice-flour ukadiche modaks, to the more modern 'chocolate' modaks that have also grown popular - these steamed, sweet-stuffed morsels are always worth the wait! Once mango season rolls around, it's a sweet bonanza for everyone! From aamras, to mango barfi - there are many types of mango-flvoured treats available, but mango shrikhand is one of the most popular. This yogurt-based sweet dish is either enjoyed plain (as dessert), or scooped up and eaten with fresh pooris. 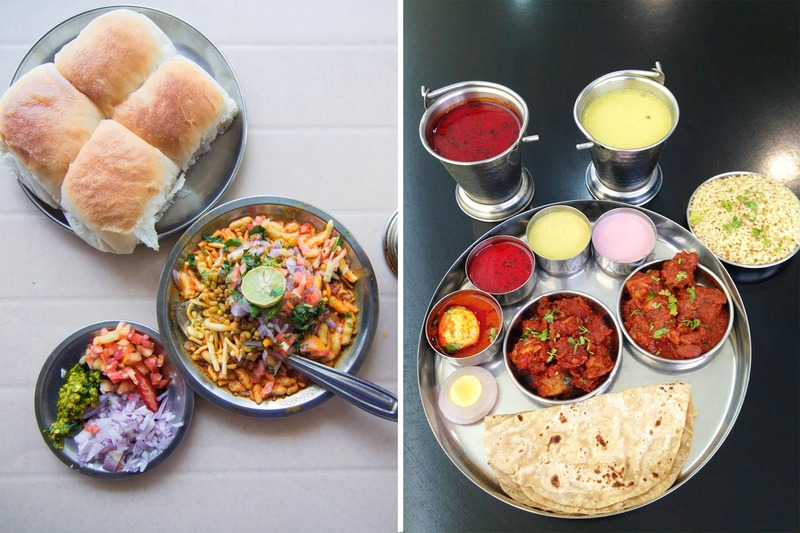 True blue Punekars are obsessed with their misal pav. Misal is an authentic Maharashtrian snack served with gravy and bread. While every eatery in the city has misal on the menu, you'll find different styles and variations.